For years I’ve been preaching the merits of being an active investor versus a passive investor. The unique aspect of my approach is to use passive index strategies with ETFs to make active asset allocation decisions. Asset allocation is far more important than security selection to the bottom line returns in your portfolios. In my modelling, we look out over the next 1, 3, and 12 months and estimate forecasts for all the ETFs that we can potentially hold in our portfolios. For this example, I’m simply going to use exposure to US large cap stocks, the S&P 500. Beta is the risk of owning the market. A beta reading of 1, means 100% of the risk and potential return of the benchmark (the market). A beta of -1, would be the complete inverse of the market return. Today, you can use inverse ETFs to gain negative beta exposure to invest in markets from the short side. We are not going to focus on that today. We are going to look at use of lower risk and option strategies to manage portfolio volatility. And as much as I talk about being active, nobody can time the market. Being in and being out sitting in cash is a foolish strategy. When the risk factors are high, I want an asset mix with less risk, when the risk factors are low, I want a portfolio that will capture as much upside as possible. Understanding beta (sensitivity to market risk) is a major key. My investment philosophy is very much like evaluating the risk when gambling. I like to use the Black Jack analogy. When the dealer has a 6 and you have a pair of 8s, the probability is that the deal goes bust. You split your cards and you double your bet. If there are a lot of high cards left in the deck (assuming you’re good at card counting), the probability the dealer goes bust is even higher. With lots of low cards left, the odds of winning go down. But if the dealer had an 8 showing and you had a pair of 6s, you would be a statistical fool (or a gambler) to split your cards. In fact, if you could, you would want to take your bet back. So when evaluating market return and risk potential (i.e. forecasting), it the risks seem higher than the potential return, the smart thing to do is reduce your risk. But that does not mean going to cash. What if your forecast was wrong. For the best of us, I know that my long-term track record is about 62% correct when forecasting. That means I’m wrong an awful lot (38%). Portfolio construction (asset allocation) is the most important concept that investors need to master. It’s really the only effective way to control the risk in your portfolio. You can try trading and using stops, but you’ll probably find that very frustrating in the long run. I learned that lesson many times over the years and have continually migrated towards asset allocation to control risk rather than using stops. Let’s look at 5 ways to hold exposure to US large caps. The beta or risk versus the market and the yield. When my outlook suggest there are more downside risks than upside potential, I tilt towards ETFs that have less beta (risk) and higher yield versus the market risk. There are three great ETFs I use in the 3 BMO portfolios I manage. ZLU is the low volatility ETF. ZPW is a put write strategy that sells put options to generate yield on some of the best large US companies. ZWH is a collection of the best dividend paying stocks in the US with a covered call options overlay further enhancing yield. Combining these 3 ETFs on an equal weight basis, gives me about half the risk (beta) of the S&P 500 and about 3 times the yield. 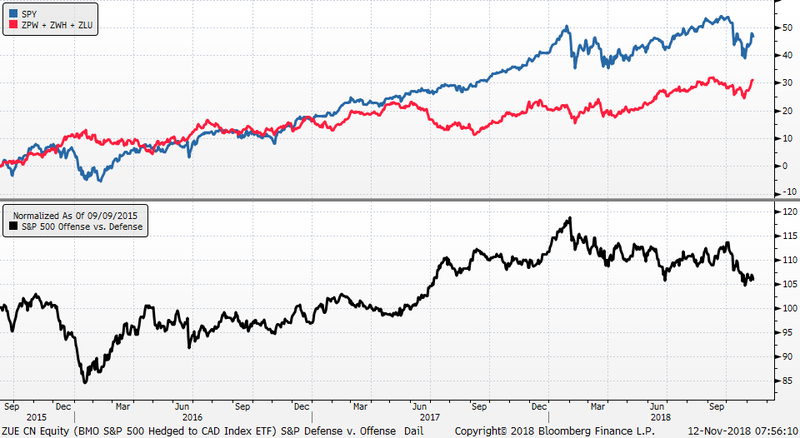 As markets face risk events like an election, I use more defensive ETFs (ZLU, ZPW, ZWH) and when the markets correct, I shift back to my higher beta exposure (ZUE, ZSP). In 2016 when we had our last high volatility period like we are seeing this year, the lower risk portfolio did very well. In 2017, when VIX averaged around 10, the high beta portfolio did very well. This year, the lower risk portfolio is doing better again. Shift to offense when markets sell off and when they are in higher risk of a correction, shift to defense. You’ll sleep much better at night. Currently, I have a higher beta exposure that we added near recent lows for the US market. The probability that we move higher in the next few months is good. But the more we rally now, the more defensive I will get. A recession is coming and it will offer some great buying opportunities. 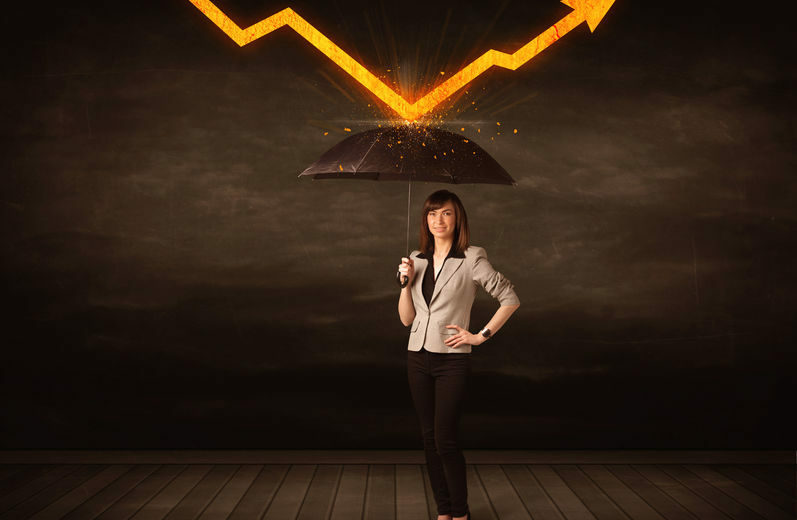 A defensive portfolio with higher yield will weather the storm a bit better…whenever it comes. Our fall roadshow dates are out. Come out and find out how to profit while protecting in the longest bull market of all-time, where I will look at some of my top sector ETF picks for the next few years and teach you how to build balanced portfolios using less risky options strategies that will work better in the next few years. Click here to register for free and as always we ask for volunteer donations to one of our two favourite charities. Children’s cancer research at the Sick Kids Hospital and Alzheimer’s and dementia research at the Baycrest Hospital.